Purple Turtle: SNG flyaway South Africa. 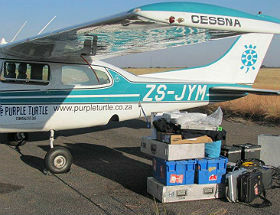 For rapid response SNG and to ease delays in customs, Purple Turtle SNG Services in South Africa are making use of their own aircraft - a Cessna 210 - to fly the “Fly away SNG” around Southern Africa taking the concept of “Fly away” quiet literally. The short field performance of the Cessna 210 makes it ideal for this type of operation as it allows Purple Turtle to land at smaller air strips allowing shorter on site times than traditional commercial flights. Purple Turtle said, "The best thing of all is that the savings in Cargo/Flights is passed on to the client which helps the ever important bottom line."